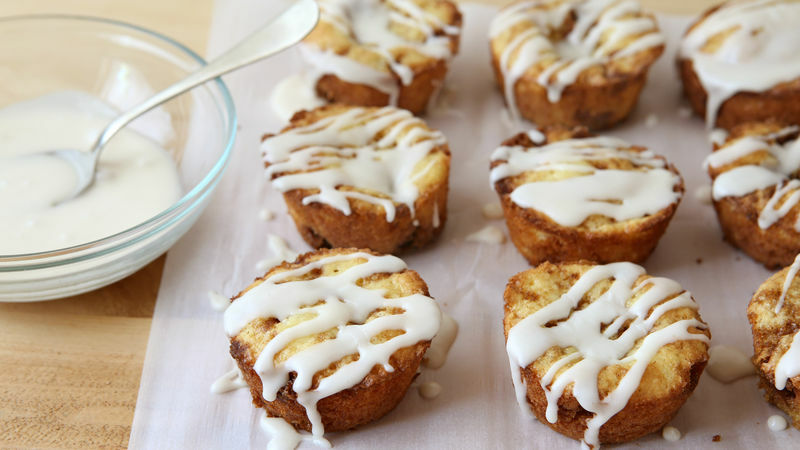 These genius muffins have all of the great flavor of a cinnamon roll, made easy in a muffin-tin. 1 Heat oven to 400°F. Spray 24 regular-size muffin cups with cooking spray. 2 In large bowl, beat cake mix, 1 cup milk, the softened butter and eggs with electric mixer on medium speed until smooth. In small bowl, mix brown sugar, cinnamon and melted butter. Gently stir half of mixture into batter in large bowl. Fill muffin cups two-thirds full. Top with remaining cinnamon mixture. 3 Bake 12 to 15 minutes or until edges are golden and toothpick inserted in center comes out with a few moist crumbs. Cool in pan 5 minutes, then remove to cooling rack. 4 In small bowl, beat Icing ingredients with whisk. Drizzle over warm or cooled muffins.